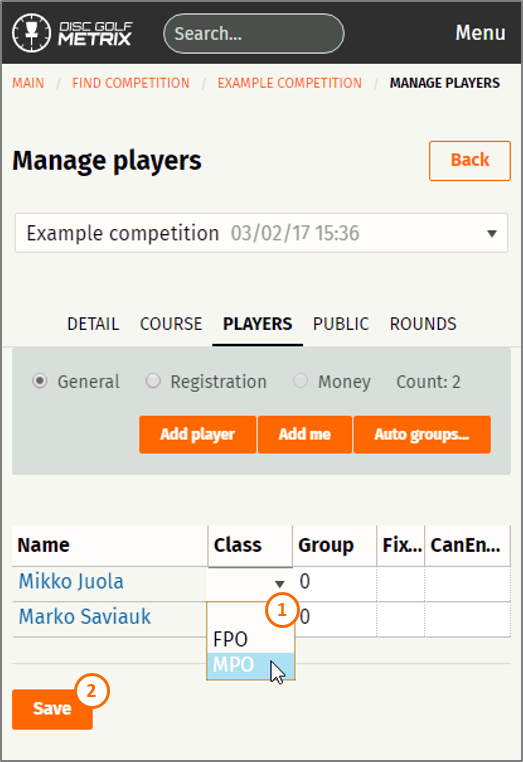 Players can be added to a round from two different places: just before starting to enter scores or from competion settings. For the second option, go to "Edit competition" then "Players" and them "Add player" will open the same screen as the second one above. In case you're adding players to a competition which uses groups or classes, remember to set correct class and group to a player after adding him/her to the competition. You can change class, group and other values directly from the players list/table. But remember to Save all changes before moving to any other page. Note, you can also add players in the middle of a round if needed.